Thiruvallikkeni is replete with Festivities. After the Theppothsavam, comes the Thavana Uthsavam. It would amaze one to understand the significance of each Uthsavam and the care with which our elders have designed them. Thavana Uthsava Bungalow derives its name from the Thavana Uthsavam that occurs for 5 days starting Masi Krithikai. This Bungalow as I could recall from my young days, had a big well with steps inside, trees of rose Nerium Oleander [Arali] and a differently looking structure having two ‘goris’ [minars] ~ one can reach the top of the minars through the steps provided one is not afraid of bats. Enthusiastic residents would draw water from the well, sprinkle on the sands that surround the raised structure, colourful kolams will be drawn adding to the religious atmosphere. 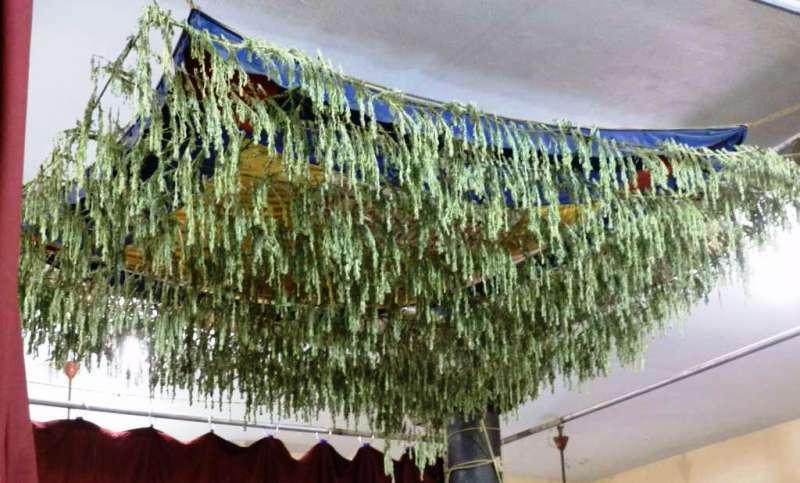 During this Uthsavam, Perumal takes rest under the roof made of thavanam – (Tamil: தவனம்) [Artemisia pallens], an aromatic herb, in genus of small herbs or shrubs, xerophytic in nature. This herb pervades great aroma and provides coolness. These days a kooralam [roof] made of Dhavanam is set up over the resting place of the Lord. நம் எம்பெருமான் ஸ்ரீமன் நாரயணன் - அஹங்காரத்தாலே அடிபணியாதிருந்த இரணியனை தொலைத்து, தனது பக்தன் ப்ரஹ்லாதனுக்கு அருள்புரிந்தவன். அவ்வாறு சிறப்பு வாய்ந்த அவனது உபய பாதங்களை அடைவதற்கு எளிதான உபாயம் - நரசிங்கமாக அவதரித்த பெருமானுடைய திருநாமங்களை, கலக்கம் இல்லாமல் உள்ளம் தெளிந்து - எப்போதும் அவற்றை எண்ணி உச்சரிப்பதே !! Poigaialwar shows the easy way of reaching the Lotus feet of Sriman Naryaana by advising us : 0 Heart, don’t ever have any confusion ! – Sriman Narayana killed the pride-ridden Hiranya, for the sake of devout Prahalada. Think of that Lord who took form of Narasimha to get rid of the enemy of Baktha Prahlada; chant thy name always – and there is no other easier recipe for reaching the most benevolent Lord Sriman Narayana.